We know that introducing your baby to food can be both exciting and a little daunting. 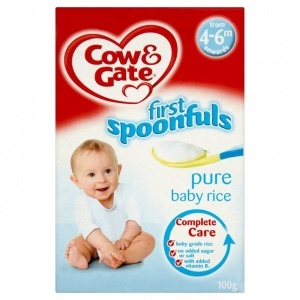 So, with that in mind, we created Cow & Gate first spoonfuls baby rice to be the perfect first food for your baby. Our recipe contains added vitamin B1, which is really important for babies, with no added salt or sugar and absolutely no preservatives. Mixed with your baby's usual milk it is a gentle way to introduce food. From there, your baby's food adventure begins. 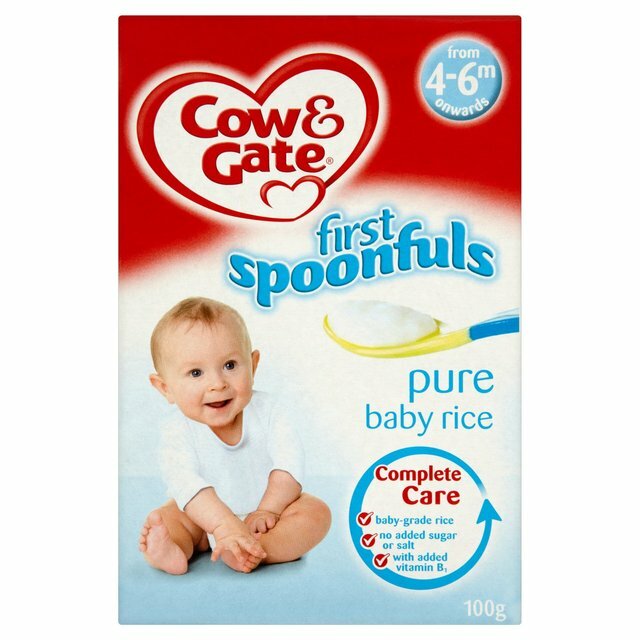 When your baby is ready to try something new, our Cow & Gate Sunny Start porridges are the ideal next step. All gluten free, they have the same smooth texture with a variety of gentle grains and fruits. ... baby rice is an ideal first food because it is gentle, and mixed with baby's usual milk has a mild and familiar taste. The contents of this pack may settle. Packaged in a protective atmosphere. per 100g dry product : Energy 1643kJ/387kcal, Fat 1.2g, of which, saturates 0.2g, Carbohydrate 86.1g, of which, sugars 0.21g, Fibre 0,5g, Protein 7.7g, Salt 0.04g, Thiamin (B1) 0.7mg, *LRV (Labelling Reference Value) is a guide to the amount of vitamins or minerals needed per day to meet the requirements of infants and young children. Using a clean bowl and feeding spoon, mix 1 spoon of baby rice with 10 spoons of your baby's usual milk, warm or cold, and stir. If serving warm, check the temperature of the baby rice before feeding. This is only a guide; if you want to alter the consistency, add more or less milk as required. Please store this product in a dry, cool place (not in the fridge) and once opened use within 28 days. Best before - see base of pack.